Glass-bottomed boats grew famous here as did underwater photography. Even Tarzan was lured to the springs; six of the movies in the 1930s and ’40s were filmed here. 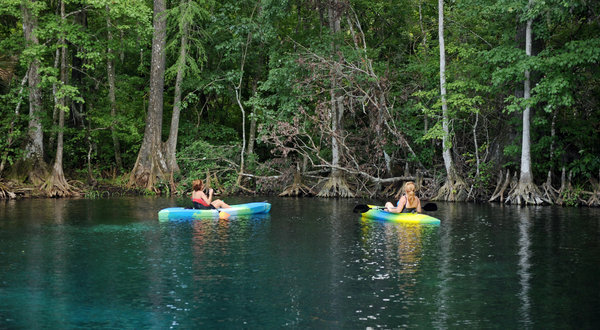 Tourists arrived in droves to these springs, just outside Ocala. The riverscape — with anhingas drying their wings in the sun, alligators lolling near the banks and native hibiscus in bloom — is beautiful. But its fragility is plain to see. Except for a few patches, the bottom of Silver Springs and Silver River are no longer visible, covered by invasive weeds coated with algae. The springs scarcely bubble up. Its flow rate has dropped by a third. The current moves as slowly as the red-bellied turtles that sun themselves on logs, allowing toxic nitrates to choke the water. The culprits, environmental experts say, are a recent drought in north-central Florida and decades of pumping groundwater out of the aquifer to meet the demands of Florida’s population boom, its sprinklers and its agricultural industry. To what degree the overconsumption of groundwater is to blame for the changes is being batted back and forth between environmentalists and the state’s water keepers. But, for the first time, a state with so much rain — the vast majority of it uncaptured — is beginning to seriously fret about water. But Silver Springs is not alone in its distress. In the last 10 years, many of the famous freshwater springs and rivers in the central and northern parts of the state have seen a sharp drop-off in flows and a steady rise in algae. Nearby Rainbow Springs and River are also suffering, although not as much. The declines have accelerated rapidly in the past five years, so much so that they have galvanized Florida environmentalists to launch a broad campaign to bring attention to the problem and spur Gov. Rick Scott to act.